You are here: Home / Smoothies/Drinks / Paleo Orange Greensicle Smoothie – A Full Meal Deal! Paleo Orange Greensicle Smoothie – A Full Meal Deal! A Paleo orange smoothie bursting with bright flavors and loaded with good-for you ingredients! This full eal smoothie will keep you sated for hours with its healthy fats and protein! Whenever we do smoothies in this house, they are almost ALWAYS as a meal. This Paleo orange smoothie is no exception! I have had to really practice at getting good at smoothie making. It did not seem to come naturally to me like baking. I have not been willing to sacrifice my health beliefs for taste…it needs to be NUTRITIOUS and not loaded with added sugars. Add in the curve ball of no top 8 allergens or corn…and it gets even more challenging! In the beginning, I had LOTS of failures. Slowly but surely however, I have been able to learn and get into a groove with my new smoothie recipe attempts. My biggest challenge is getting some protein in these smoothies for my son. When you take protein powders out, you need to be creative about your protein additions. My sons allergies mean almost all protein powders are not an option…and the 2 or three I have found that do not contain a trigger for him taste nasty. But having protein in our smoothies is totally necessary as he is SO picky! Protein is ALSO key to the staying power of a smoothie, along with a dose of healthy fats. And a smoothie made entirely of fruits just isn’t going to stick with you for any length of time. Collagen: lends no flavor, but has SO many gut healing, hair, skin, and nail benefits…I add this wherever I can!! My favorite brand tests vigorously to make sure their is no Round Up residue from the pasture raised animals! You can use code tessa10 on any order for 10% off anything! Chia seeds or hemp hearts add additional protein and goodies without altering the flavor much too! This particular Paleo orange smoothie was born in the winter months when there is limited in-season produce. Citrus is plentiful however,and it is tasty and affordable!! In this smoothie, I left some of the zested peel and pith intact on the oranges. I simply use a knife to roughly peel….it’s quicker and cleaner for me to prep it this way. A high powered blender is needed to pulverize all the peel though, so remove the whole thing if you do not have one. And if the white pith is super thick, it’s too bitter to use much, so use caution. Carefully hand-picked and dried from the South American rainforest,Camu Camu powder is 100% certified organic and raw with no additives or fillers! Camu Camu berries are amazing superfruits that are said to contain more vitamin C than any other known botanical source. It is estimated to have 30 times more vitamin C than oranges along with calcium, amino acids & antioxidants that can help aid in the body’s overall health and vitality. The Indigenous Amazonian people pick the Camu Camu berry (Myciaria dubia) in season, then dry and powder them, turning this purplish-red, cherry-like fruit to a light beige color. It has been traditionally used as a medicinal herb, improving the bodily functions of the brain, eyes, heart, lungs, liver and skin. It is also believed to help ward off the common cold, influenza and other viral diseases, various health conditions such as asthma, edema and heart disease, support strong collagen, tendons and ligaments, decrease inflammation, and help deal with stress and anxiety. I also adore my whole foods vitamin c powder, much easier to digest and absorb! Want some more full meal balanced smoothies? Here are some my other recipes you could try! 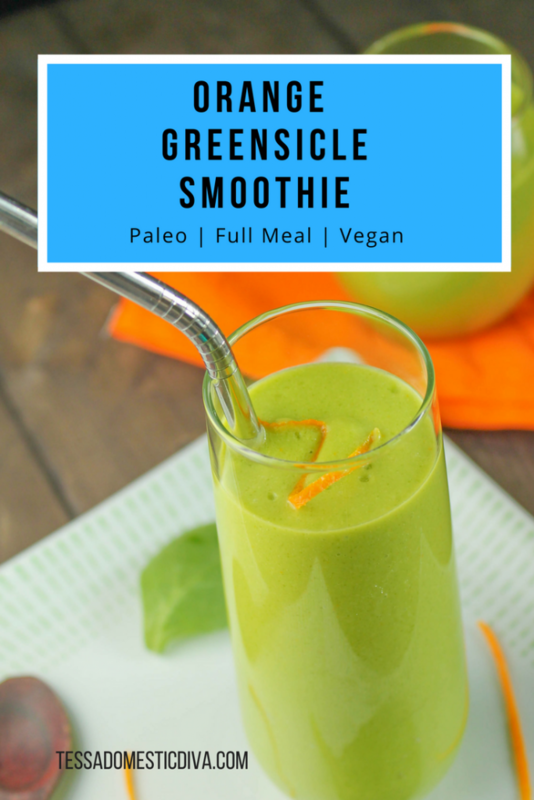 Paleo Orange Greensicle Smoothie - A Full Meal Deal! Place all ingredients in order into a high powered blender (BlendTec, Vitamix) and blend until smooth. This looks great and I’m intrigued by the camp came powder! Citrus is such a great ingredient to use when there isn’t much other fruit choices around, I love how cheap and plentiful it is in winter 🙂 Thanks for the options for protein in the smoothie besides protein powder, I always forget I can add gelatin to smoothies and etc. for an extra boost! I love the color and I love its a full meal deal! Got it tweeted and pinned to our GFF board! Thanks for linking up at Gluten Free Fridays! Looks great! Thanks for sharing on Wildcrafting Wedensday! Yum! I should use cashews more. mmmm I love a good smoothie! this sounds delish! I need to commit to making your recipes. Every time you share them, they sound so yummy. Thanks for sharing this one at Motivation Monday! hi linda…it’s there, promise!! green is one of my favorite colors! Looks delish my friend. Always love finding new smoothie recipes!! Hope you’re going well, Tessa.